Hamilton is an industrial port city in Southern Ontario, located on Lake Ontario in the Greater Golden Horseshoe region. It is the 10th most populous city in Canada. 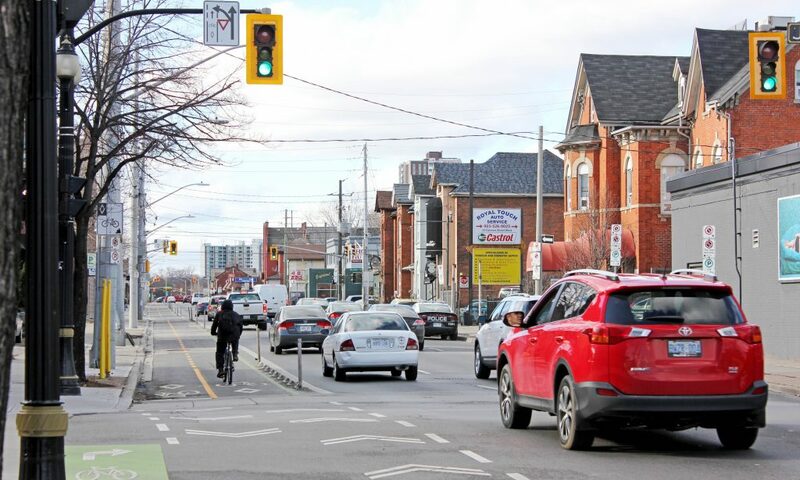 The City of Hamilton’s Transportation Master Plan is currently under review, and a Complete Streets Policy is one of the topics under discussion. “The road network shall be planned and designed to: a) be shared by all modes of transportation; b) maximize safety for all uses; and, c) minimise lifecycle environmental impacts” (C.4.2.12). 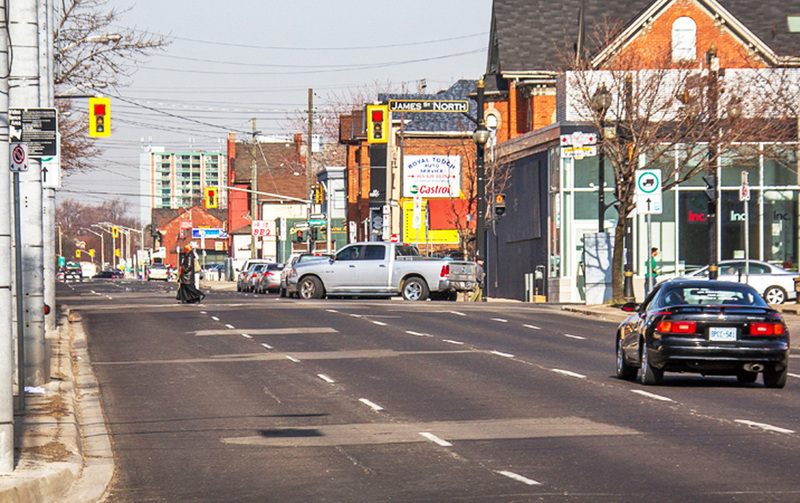 Cannon St. in Hamilton, Ontario was one of nine Complete Streets projects profiled in TCAT’s Complete Street Transformations book. 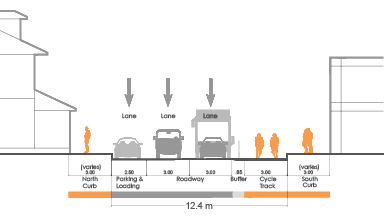 Cannon Street is a truck route, but as downtown neighbourhoods transition to better accommodate residents, a road diet has defined space for cyclists and sheltered pedestrians on existing sidewalks. A well-organized campaign by area residents, called “Yes, We Cannon,” was instrumental in changing the proposed design from on-street bike lanes to the separated cycle track that was installed. The cost of the project was $710,000, and it took 5 years to complete (2009-2014), from first being identified as a priority in the Cycling Master Plan, to the end of construction. A two-way cycle track added between Sherman Ave and Hess St, and separated from the one-way traffic lanes by planters and bollards Bike boxes for cyclists turning right have been added at certain intersections. In 2015, the average number of cyclists per day was 498, with 582 being counted on the busiest day. 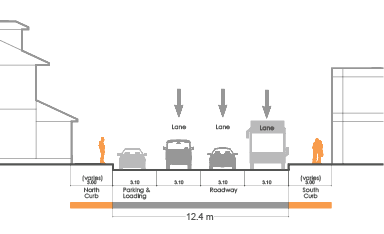 The City of Hamilton did not perform cycling counts on Cannon Street prior to the installation of the cycle track because it was not deemed to have any significant cycling traffic at all. “In the Pedestrian Mobility Plan, routine means “a series of actions regularly followed”, while accommodation means “the process of adapting or adjusting to making pedestrian mobility safer and more interesting” (this is consistent with Complete Streets approach). Routine accommodation occurs when City operational, infrastructure, planning, legislative and communication decisions also improve pedestrian infrastructure when streets, services and roads are maintained and renewed throughout the City. “Routine Accommodation” is a process where changes to improve pedestrian streetscapes utilizing a range of solutions are regularly employed on each and every project as a matter of course. This decision making process is designed to implement changes during reconstruction, ongoing maintenance, streetscape enhancements or other capital projects. Decisions are appropriate, objective, traceable and defensible” (Section E.4, p. 12).